Are you interested in expanding your experience of movement, how you approach your yoga practice, or how you think about movement in relation to injury-prevention? 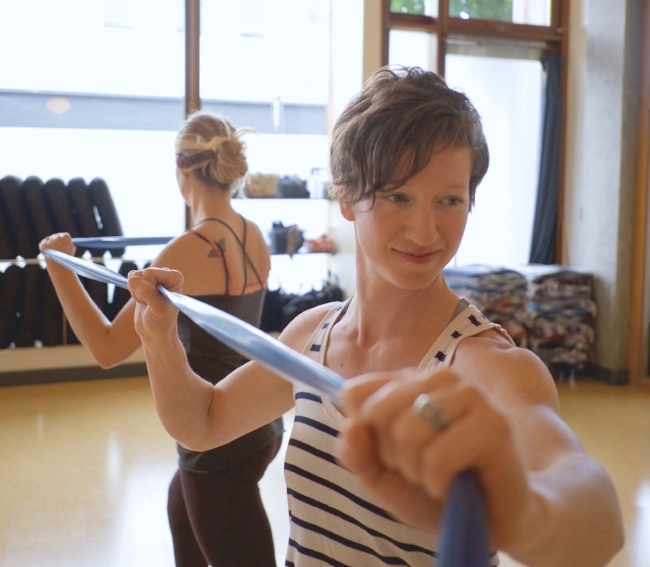 From two of our best Functional Strength movers and teachers, join Britt and Monicka in an exploration of your strength, stability, resilience in movement! In this radical, functional-movement based workshop we will explore traditional yoga asana shapes through the lens of your incredible biotensegrity structure. What is biotensegrity? Put simply, it is the forces of tension and compression in your moving body; a self organizing, hierarchical, load distributing, and low energy consuming way of looking at natural human movement. Learn how your body functions as complete unit rather than simply a collection of the more commonly understood concepts of muscle, level or bone structure/function. We'll discuss and experience firsthand some ideas around biotensegrity, but mostly we'll leave time for you to explore and identify your own felt sense and experience of how your system supports itself as a whole in different relationships to gravity. Learning these things will help you integrate your own personal understanding of your body, using bands, straps, and closed-chain (feedback with another object or person) structures, we will play with our soft tissues' ability to bounce, spring, tone and squish. Appropriate for anyone at any level that is curious, interested in an adaptable practice, and open to the changing conversation about movement and yoga. Come learn to think differently about how you move!